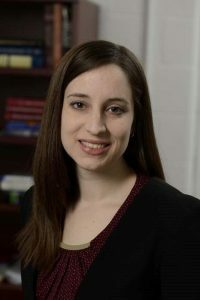 Congratulations to HEMI Fellow Susanna Thon, who has been chosen by the National Science Foundation for its prestigious CAREER Award, which recognizes early-stage scholars with high levels of promise and excellence. Thon is an assistant professor in the Department of Electrical and Computer Engineering. Prof. Thon’s research is in the field of nanomaterials engineering for optoelectronic devices, with a specific focus on renewable energy conversion and storage. Her work applies techniques from nanophotonics and scalable fabrication to produce devices and materials with novel optical and electrical functionality. Her CAREER project, “Finite-Absorption-Bandwidth Nanomaterials for Multijunction Photovoltaics and Narrow-Band Photodetectors,” has the potential to lead to a more efficient, usable, and cost-effective way of generating solar energy. Thon believes that these solar cells and light sensors could eventually help create a more efficient, usable, and cost-effective way of generating solar energy. She envisions a day when the cells and sensors could be made into paints that could be used on the exteriors of homes and other buildings to capture the sun’s energy, providing heating and cooling and powering appliances inside. She predicts that much of the work on this project will focus on achieving the level of color tuning control needed to obtain optimal results—a challenge that she feels certain that she and her excellent team at Johns Hopkins can meet.